Been a great knife. Bought mine when they first hit the market (worked for a place that was a SOG dealer). Beat the hell out of it, and it's still going strong. The pocket clip leaves a lot to be desired. I'm on my 3rd one is about 5 years. NW Ranger is great knife in price/quality ratio and (in my opinion) one of best SOG knives. To sum it up, great knife for the money but not my go to knife. Knife is very light weight. I like the design and curvature of the blade itself. VG10 is a plus as it is known to do everything just a hair better than 154 or ATS 34. BIGGEST pro, and reason I purchased, is I can carry this knife VERY deep in the pocket...so deep that all you will see is a clip. Definitely great for everyday carry as I dont like it being obvious I am carrying a knife (esp in the office,). Last pro I will add is the "arc lock" i believe it is called. My favorite style of lock on a folder. The Arc lock functions great but not a solid a lockup as my BM 710 or 806. With that said it is still secure feeling. I don't believe any steel is used in the handle, just a fiberglass like material that has a little bit of flex. I think some steel liners would have been a plus, but they add weight. BIGGEST con as well as my biggest pro would also be the clip. I do like how deep you can conceal this knife, but at the same time it is very hard to pull out of your pocket when you have it so deep. The clip bites harder on your jeans the lower you push it. Not a big issue, but in a self defense situation, it is a concern as I do not feel confident I can draw this knife from the pocket quickly. This may loosen up over time but have been carrying for 2 mons and issue remains. I bought this knife and two Benchmade Griptillians at the same time. I thought I would like this knife but I am a huge Benchmade fan so I gave them all a try. After weeks of back and forth I finally settled on the Visionary II as my EDC knife. The black coating SOG uses is superior to Benchmades, showing few marks under medium use. I settled with this knife over the two Griptillians for a few other reasons. It is thinner and sits deeper in the pocket, it is lighter ( by just a hair ) the blade opens as fast as an open assist blade and has a very refined feel when the blade is pushed out. The black coating in conjunction with the rust resistant VG-10 steel make this blade highly resistant to rust therefore very low maintenance. The lock up is nice and tight and from all accounts the Arc Lock is tremendously strong, very similar to Benchmades Axis lock ( These two locking systems are why I basically only buy SOG or Benchmade now). The handle is made of a Zytel type plastic with very thin liners and after two months of daily use including being dropped the handle shows no scratches or scuffs. One of my initial concerns was the handle, being thin and with few contours I was worried about it would feel in my large hand. IMO the Griptillian is more comfortable in the hand, and would be a better hard use knife, I found the Visionary II's grip to be surprisingly comfortable and very adequate for light to med EDC use. The VG-10 blade holds and edge very well and the curved blade is a cutting beast but is slightly more difficult to sharpen than a plain straight edge knife. 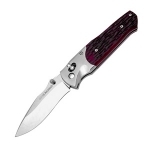 The drawbacks are, a slight, very slight, side to side wiggle in the blade during lockup, typical with a folder this thin, but not enough to cause any kind of concern. Another drawback is the position of the lanyard whole. With the bayonet style clip SOG uses there really is no alternative. I almost always use a lanyard and with SOG knives it can bind slightly when you try to clip the knife all the way down onto the pocket rim. All in all the knife is a really great overall EDC knife, not really made for day in day out hard use but is more than worthy of getting you out of the occasional tough bind you might find yourself in. Very thin, very light weight, durable and has a tremendously refined feel in its action.